Born in 1904 in Osijek to an impoverished Hungarian family of fourteen children, Fejes was taught to make buttons and combs by his father at an early age to help support the family. These items were made from discarded bones found at slaughterhouses. Fejes continued this resourceful and decorative trade until his death. Throughout his life Fejes suffered from asthma and sciatica, which kept him bed-ridden for increasing periods of time. Painting, which he discovered in 1949, and his expanding postcard collection were ways to keep himself entertained, although his wife felt this was an extravagance. 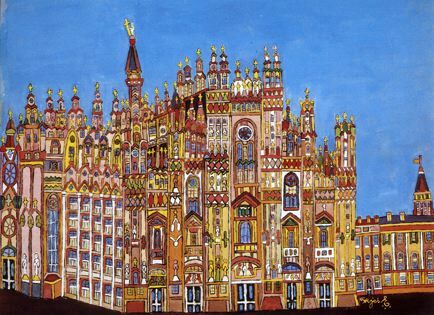 Fejes painted images of cities and their architecture based on what he knew of the world from his postcards. He did not, however, slavishly reproduce what he saw in the photographic images. Instead, wearing two pairs of glasses as a magnifying aid, he would enlarge the scene, changing colors and adding details at whim. He used matchsticks instead of brushes and relished bright colors, keeping his paints in beer bottle tops. Fejes died in 1969, leaving behind many buttons and combs, and hundreds of pictures, which are much adimired for their lack of inhibition, universal appeal and synthesis of human values.